Michiana is no exception. 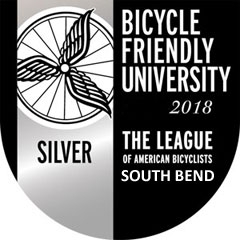 South Bend Mayor Luecke and bicycle enthusiasts gathered in the Morris Performing Arts Center on April 28 for special recognition and announcements. The highlight of the event was the presentation to the city of the Bicycle Friendly Community (BFC) award. Nancy Tibbett, a representative of the League of American Bicyclists and Executive Director of Bicycle Indiana made the presentation. Several community leaders offered congratulatory comments preceding the unveiling of the official BFC signage which will be seen around the city in coming weeks. To complete the event, Luecke issued a proclamation making May a Bike Month in South Bend. This is the second year the mayor has issued this proclamation. 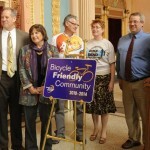 Pictured above are Judy Lee, President of Bike Michiana Coalition; Steve Luecke, Mayor of South Bend; Nancy Tibbett, Executive Director of Bicycle Indiana; J.V. Peacock, chair of Michiana Bike to Work Week; Glenda Lamont, Director of Bike the Bend; Chris Dressel, South Bend Bicycle Coordinator; Laurie LaDow, Realtor, Cressy and Everett; and Rob DeCleene, Executive Director, South Bend / Mishawaka Convention and Visitors Bureau.